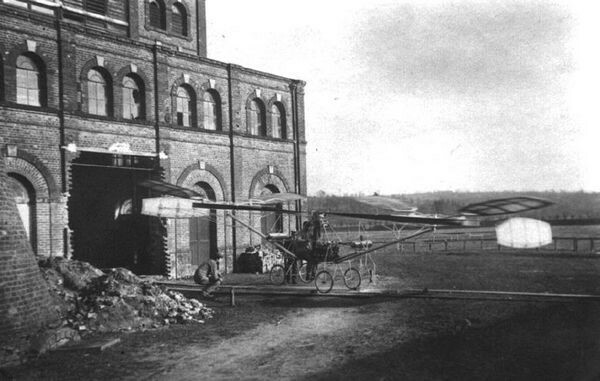 At Coquainvilliers, near Lisieux, France, Paul Cornu, a bicycle maker, built a practical helicopter with fore-and-aft rotors driven by belts from a 24-hp Antoinette engine, which made a free flight lasting about 20 seconds on 13 November 1907. The machine was stabilized with sticks by men on the ground because of its poor controllability. Powered by an Antoinette engine, it rose about 1 foot on its first flight, and then climbed to 5 feet carrying Cornu and his brother. The central frame supported the engine, pilot seat and fuel tank, and the whole contraption weighed just over 250kg. To rock the ship from side to side, or to nose up and down, there were movable flat surfaces ‘control vanes’ mounted under the rotors so the airflow would push against them. The system on the Cornu machine was ineffectual. The chassis rested on a four-wheeled landing gear. The rotors were paddle-shaped and fabric-covered, mounted on large horizontal, bicycle-type wheels situated one at each end of the machine. 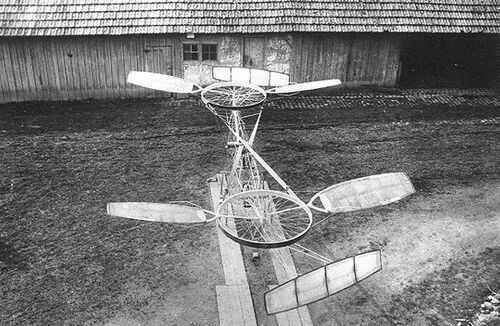 The design followed that of a small scale model made by Cornu a year or so previously with 2.25m rotors, a 2hp Buchet engine and a weight of 13kg. The full-scale machine made its second flight with Cornu's brother hanging on to the framework, increasing the total weight to 328kg, and take-offs to about 2m were made later carrying the pilot only. Cornu was unfortunate in that his flight came just as public hysteria was focusing on the fixed-wing achievements of the Wrights. He was unable to obtain support for developing his heli-copter.